A contemporary tract that addresses questions about the meaning of life. Printed in full-colour throughout, 36 pages, credit card size, on quality paper with eye-catching design and written in a non-confrontational, conversational style. 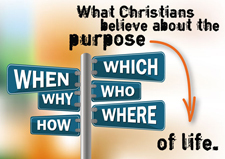 This booklet will help answer the questions many people have about Christianity and the purpose of life.